Οι Vampyromorpha είναι ένα διμελές συγκρότημα από την Γερμανία. Δημιουργήθηκαν προ τετραετίας, αρέσκονται σε ένα heavy / doom ύφος, χαρακτηρίζουν την μουσική τους ως AOD - Adult Orientated (Horror) Doom και δηλώνουν ως αγαπημένα τους συγκροτήματα τους: Candlemass, Black Sabbath, Mountain, MC5, Queen, Yes, Ramones, King Crimson, UFO. Δελτίο τύπου: «Born from the depths of the bloody oceans of hell and shaped by the most disturbing trash horror movies, VAMPYROMORPHA is out to play spaced out Adult Oriented Doom Metal drenched in gallons of red wine and frightening tales of sinisterness and sickness. This unique project was founded by Nemes Black (Guitar, Bass Guitar & Drums) and Jim Grant (Vocals, Hammond) in 2014 and will unveil its very first recording via German-based record label Trollzorn Records on May 27th this year. 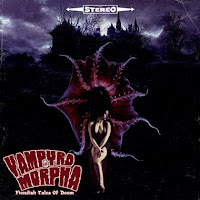 The debut’s name says it all: “Fiendish Tales of Doom” offers morbid yet fairytale-like lyrics sucking their listeners to the depths of doom right away. Inspired by legends like PENTAGRAM, CANDLEMASS, WITCHFINDER GENERAL, SAINT VITUS, PAGAN ALTAR and DEATH SS, the two-man-project is sapping oblique influence from bands like THE SISTERS OF MERCY, KILLING JOKE, THE MELVINS and THE DAMNED as well. The result is Black’s and Grant’s very own interpretation of depressive Doom Rock. Album: "Fiendish Tales of Doom"